A departure! This is an audiobook, but it's not by Bill Bryson. I enjoyed it anyway, and thoroughly. So thoroughly, in fact, that I had to sit in my car after arriving at work (early, I had to run some errands beforehand that took less time than anticipated) and finish listening to the final disc. It was about 25 minutes of sitting in a rapidly cooling car in the snow, but don't think I noticed the cold. I just had to know how it all turned out. 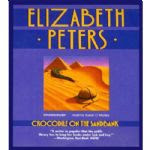 I have been wanting to read Elizabeth Peters for quite a while now. These books were another set of mysteries that kept turning up on my mother's piles, much like the Ellis Peters Brother Cadfael mysteries. My mother has good taste. But I am not reading as much as I would like, lately, and I happen to be spending more time than I would like in a car. Seeing a way I could mitigate these problems in one swift move, I dug out the information on how to download audiobooks through the library I work at, and lo and behold what should turn up but Crocodile on the Sandbank. Experiment: success! Also, now I can tell people how to download and use our digital audiobooks from experience, rather than following vague directions. Bonus. Amelia Peabody is a Victorian lady of independent means after her father passes away. He was a scholar, with a particular emphasis on ancient history, and Amelia has spent her life caring for him (as the only girl child, and no other woman in the house), during which time she has also become very interested in antiquities. She knows several languages, living and dead, and has more than enough money to live the rest of her life on her own quite comfortably, travelling to see the places she and her father have studied about. On her first trip, to Rome, she encounters a young woman nearly dying of exposure near one of the ancient ruins. In her no-nonsense fashion, Amelia saves the girl Evelyn and collects her as a companion for her travels. As they reach Egypt, and through a series of events become attached to a very small archaeological dig, it becomes clear that one of their little group is being targeted by persons -- or perhaps vengeful spirits -- unknown. Amelia must now bend all her considerable powers of intellect to discovering the culprits before someone gets seriously hurt, or worse. I had some difficulty getting into this one, at the start. As I've stated before, I'm not wild about fiction in audiobook format; too often the narrator doesn't work for me, whereas in nonfiction I can usually put up with a fair bit (my present nonfiction listen excepted; for some reason, the narrator has such an odd inflection and word pacing that I can't help but think of Futurama's Zapp Brannigan, and I have had to stop listening to it). In this case, though, I didn't mind the narrator, though sometimes her male voices were a bit grating. As to the story itself, it starts off a bit slowly, but tension keeps ratcheting up until one cannot possibly stop listening until one finishes the story. Amelia is a delightful character, absolutely flawed but believably and endearingly so. She is headstrong to the point of ridiculousness, but it was somehow charming; and she is still a somewhat believable Victorian lady -- given her background, a little bit of eccentricity is to be expected. The other characters are charming and well-fleshed-out. The mystery is a little predictable; the foreshadowing is a bit on the blunt side, occasionally, and I figured I knew the culprit somewhere near the halfway point, and even the motive, though it took Amelia until the very end of the book to figure it out herself. Usually this can be a deal-killer for me in a mystery, but I was enjoying everything else so much that I didn't feel the need to stop. An occasional eye roll may have occurred. For my part, I wanted to know how, because that wasn't at all clear to me or Amelia, which I think is what lead her to her frustrating inability to solve the case until so late in the game. Me, I was following Holmes -- once you eliminate the impossible, whatever remains, however improbable, must be the truth. Speaking of impossible and improbable -- well, there are a few times where the plotline and character motivations leap from somewhat incredible to beyond the pale. I was prepared to forgive these leaps for the most part. They were, in large part, some of the fun. This is not a realistic book, and shouldn't be read that way. I quite enjoyed this one, enough that I am now listening to the second book in the series and enjoying it too. The humour, the adventure, the romance, and the exotic location (Egypt is wonderfully and lovingly described) all combined to make this an excellent listen for me. I could see finding and owning a copy of this one in paper. I certainly will want to read it, or at least listen to it, again. If you can possibly, possibly get ahold of the Recorded Books version read by Barbara Rosenblat, please do. She is wonderful. She *is* Amelia. I've listened to the whole series with her reading each book and it is one of the best reading experiences of my life. really. not kidding. It's not in our library system, but I liked the story enough that I could see buying it and it would be interesting (maybe I'm weird?) to listen to the same story with a different reader. I'll try to find it! I read the first few of these years ago and enjoyed them, but now they are vague in my mind, so to continue I'll need to go back and reread. Audio is a great way to go for that - and thanks, Nan, for the reader recommendation. My library has a different reader for the CD version vs. the e-audio version, so CDs it is! We've got the e-audio version, but not the CD version (we've got CD versions for many of the newer ones, though). I'd be interested to know why the e-audio and the CD versions have different readers. It seems odd to me! But I've noticed the same with the JD Robb "in Death" series, too. I guess it's different companies doing the different formats -- but as to why that would be happening, I can't guess. BUT what I meant to say originally, Darla, is that I'd love to hear your take on these! I've been having so much fun.